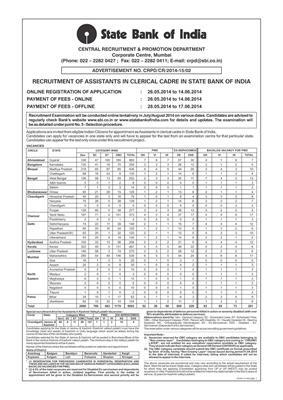 The State Bank of India had issued notification for the recruitment of vacancies for Assistant in Clerical Cadre. Out of 5092 vacancies, 487 posts are exclusively reserved for Kerala candidates. The recruitment is being made on the basis of performance shown in the entrance examination and interview. Interested candidates, who are eligible to apply for this examination, should apply by means of online mode on or before 14th June 2014. Regarding the education qualification required to apply for the exam is that the applicant should have completed graduation in any discipline from a recognised university. Candidates who were appearing in the final year of the qualifying examination can also apply for this preliminary test. Minimum age to apply for this examination is 20 years and maximum age is 28 years. The written examination is proposed to conduct during July/August 2014. The application fee for the general category candidates is fixed at Rs 450 while for the SC/ ST / Ex Service Man /PWD candidates it would be Rs.100. An objective type exam/OMR test with duration of 2 hours 15 minutes will be conducted with the paper consisting of 200 questions. The syllabus is dived into various categories like General English, Reasoning, Quantitative Aptitude, Marketing & Computer and General Awareness with 40 marks from each section. There will be negative marks in the objective test. ¼ of the marks will be deducted for each wrong answer. The online registration for the examination has started on 26th May while the last date of entry will be 14th June 2014. For more details candidates need to visit the official website of State Bank of India i.e. www.sbi.co.in. For details and updates, candidates must have to keep a close touch with the official website of SBI. Out of the 487 vacancies in Kerala, 302 are reserved for general category, 49 for SC, 5 ST and 131 for OBC applicants.